In Morocco , jews lived in the Mellah, a neighborhood surrounded by walls, separating them from the arabic population. In the 8th century, Idris 2, brother-in-law of Mohamed, finding that the jews were very handy at their work, built a wall around a neighborhood of the city near his castle, to protect the jews. But the first official Mellah was established in Fez in 1438 in order once again to protect the jews from the violence of the arabic community. 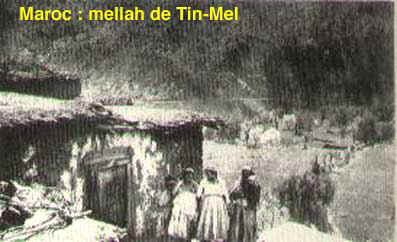 But, in the 19th century, in some cities, jews were sometimes forced to live in the Mellah. At night the gates were closed to prevent anyone from getting out. The Mellah that started out as a privileged neighborhood ended up a real jailhouse for the centuries that followed. Lodging was small, life conditions were very difficult and as the jewish population grew, the Mellah became overcrowded. Beside a few prosperous merchants, the overwhelming majority were poor. Where does the word Mellah come from? According to Andre Chouraqui, the word Mellah "..was first seen in a judeo-arabic letter, dated 1541" that meant: "place where the jews lived." Another more widespread explanation amongst the generations born in between the two world wars is that the word"mellah" means "salt" in arabic. When muslim soldiers and warriors came back from battle, they would bring back the severed heads of their ennemies as trophies. A task was forced upon the jews was to salt those heads so that they would be preserved impaled. A french reporter Henri de la Martiniere who accompanied the french army corps in 1918 wrote about the Mellah " ..there floated the nauseous smells of deep rooted filfth.The poor inhabitants showed the marks of cruel and degenerative diseases." and more"In our days,jews were forced to walk bare footed as soon as they came out of their neighborhood. We could see them take off their black shoes " (outside of the Mellah)" as a distinction with the muslims who alone were allowed to wear yellow shoes..."
The arrival of the Europeans in Morocco, near the end of the 19th century, and beginning of the 20th, allowed the jews to have access to social and economical opportunities that were previously only contained within the Mellah. They saw themselves engaged in business with the europeans and protected by the newly established courts of law. That is when the moroccan jews were finally able to evolve outside of the Mellah with a growing economical life.